If you’re like me, you enjoy a good trip to the Farmer’s Market every now and again. Perhaps you like to stroll around, appreciating what’s new, sampling new treats and admiring the enormous $10 bouquets of bright flowers! Or maybe you go to the market on a mission, to discover, collect and return home with an armful of fresh ingredients to whip up something delicious. Or maybe you’ve never been to a Farmer’s Market… but you sure like the sound of one! Whatever category you fall into, I am sure we can all agree that today’s recipe will inspire you to get to the market! 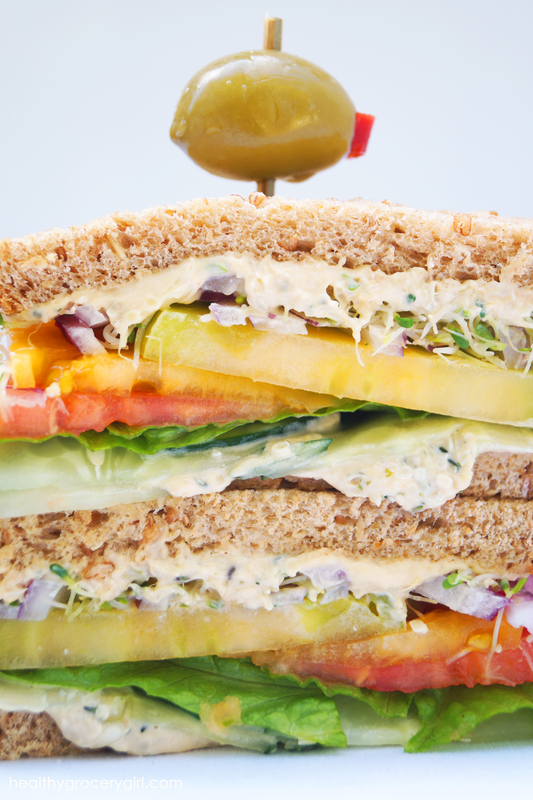 Today… we’re talking sandwiches. I love sandwiches, always have, always will. There is something about them… maybe it’s the bread (I love carbs, healthy carbs of course) or maybe it’s the endless combinations of recipes you can make. Either way, I dig them. 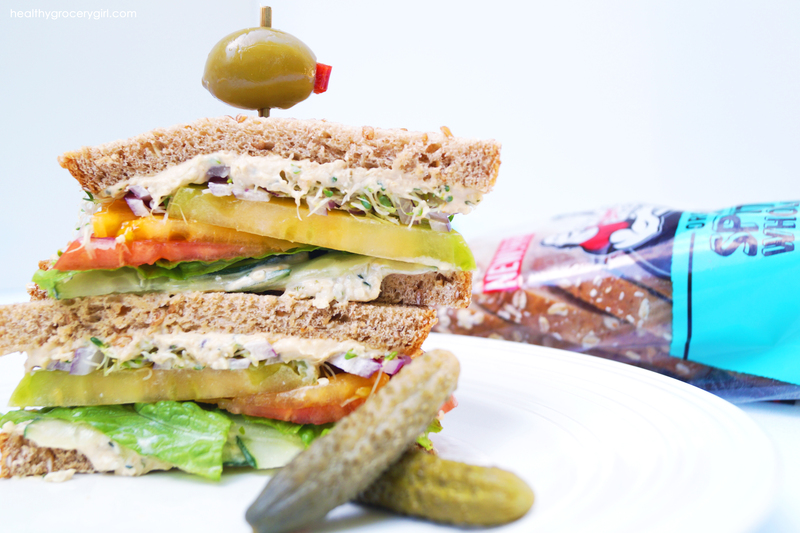 That being said, I’m excited to share with you how to make a Market Fresh Sandwich that is packed full of delicious farmer’s market ingredient finds such as heirloom tomatoes, hummus, sprouts and more (see recipe below) all held together with 2 slices of sprouted whole grain bread. Bread is a tricky category, have you read the ingredient list on most bread loaves these days? WHOA! Too many ingredients, preservatives and artificial coloring. I am all about sharing with you what I love and what I truly believe is the best of the best when it comes to Healthy Grocery Finds! That being said, I was thrilled when Dave’s Killer Bread caught on to my love for carbohydrates and asked if I would curate a delicious sandwich with their newest Organic loaf, Sprouted Whole Grains. Naturally my answer was yes! I have been a DKB fan for years. 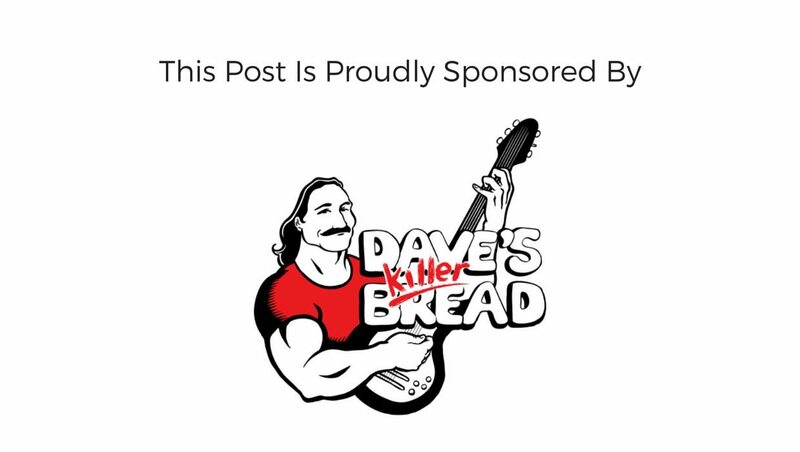 What is even more cool is that Dave’s Killer Bread started at a farmer’s market! It’s really fun to see the evolution of brands we love start from the beginning and evolve into a company so many of us have heard of and love! Let’s take a moment to celebrate the awesome benefits of their new bread shall we? 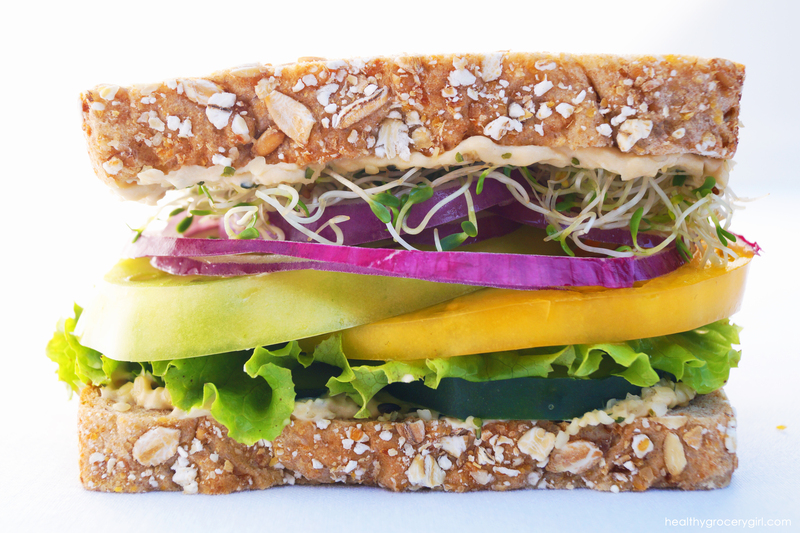 One slice is made up of 4 different sprouted grains– whole wheat, barley, oats and rye. Nutritionally speaking, each slice also contains 4 grams of protein, 3 grams of fiber and 19 grams of whole-grains! 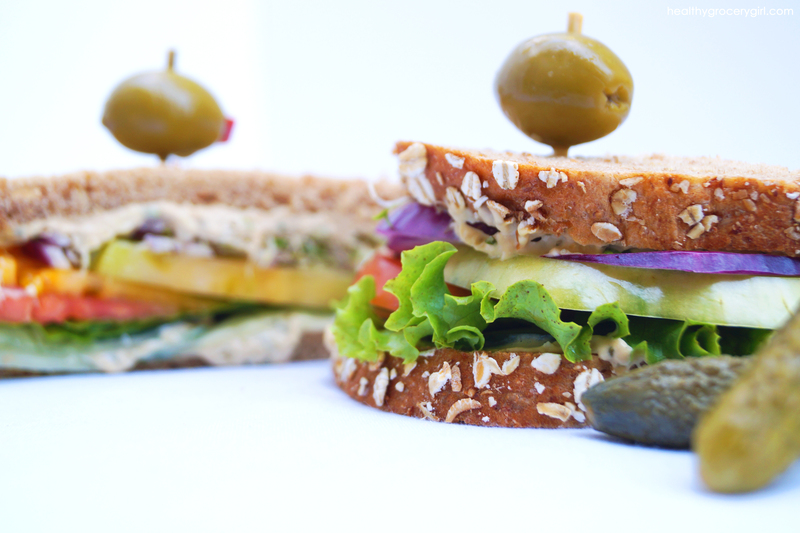 You’re probably ready for me to stop talking and start sandwich-ing so… let’s get to it! Please enjoy this lovely recipe… view, print, share… whatever you fancy! If you get a chance to make this sandwich, which I hope you do, I would love to know what you think! Connect me further in the comments section below! This vegan sandwich is so good! Toast each slice of bread, and it will feel like your birthday. Top with the second piece of bread and enjoy! 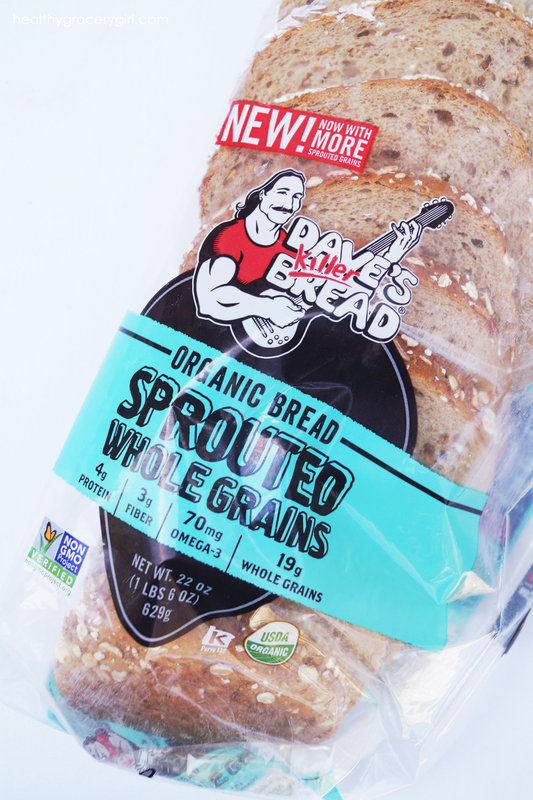 Did you know that 2 slices of Sprouted Whole Grain Bread from Dave's Killer Bread provides 8 grams or protein! Hemp seeds and hummus also add protein to this meal… wow!